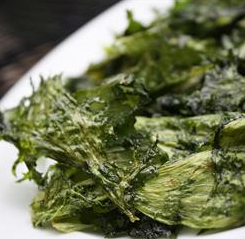 Kale chips are super delicious, super easy to make, and a great healthy alternative to potato chips. They are light, crispy, salty, and almost dissolve in your mouth like cotton candy. Yum! I totally recommend these as a snack or light veggie along side chicken or fish. Orange you going to say 'thank you'?